Children are always on the lookout for the bigger, better toy. Whether it's a new computer after you just bought them an iPod or a pool in place of a squirt gun, if you give your kids an inch, they'll often take a mile. And while you may be willing to give into some requests, you might want to hold off on picking up that backyard trampoline they've been bugging you about. 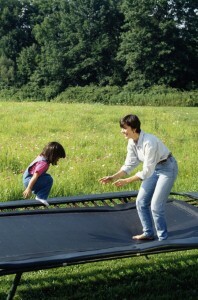 Recently, the American Academy of Pediatrics spoke out against children using home trampolines. There are approximately 98,000 injuries caused by these playthings every year – 31,000 of which lead to hospitalization in 2009. These results are staggering, especially considering the AAP had officially warned parents about the dangers of trampolines in 1999 and 2006. But what about kids using trampolines under parental supervision and with safety nets in place? Well, it seems that even these supposed precautions haven't done much to decrease the number of sprains, bone breakage, muscles strains and spinal damage for rambunctious little ones. The best way for kids to avoid injuring themselves is for parents not to buy backyard trampolines in the first place.